Sorry to break it to those of you who lament the incursion of electronics into the backcountry -- clever ideas for juicing portable devices just keep coming. Here's a look at notable portable-power products featured last week at Outdoor Retailer Summer Market 2010 in Salt Lake City, Utah. PEG means portable energy generator. It's the brainchild of Aaron LeMieux, an entrepreneur/engineer who created Tremont Electric to capitalize on something he learned while hiking 1,500 miles on the Appalachian Trail: Walking with a heavy pack generates lots of untapped energy. The result is coming on the market in a few weeks: the nPower PEG, which captures kinetic energy from walking and stores it in a battery that can power small electronics like cellphones and iPods. The tubular PEG has springs on each end and a magnet in the middle -- the motion of walking pushes the magnet back and forth against the springs, keeping the magnet moving and generating electrical current. A microprocessor keeps the current steady enough to charge a lithium polymer battery that recharges an electronic device. The PEG sells for $149.99 and weighs just under 12 ounces. It's 9 inches long and 1.5 inches wide (the narrow sections are 1 inch wide). It can be charged via a computer's USB port, or via a USB wall charger. The package includes an iGo cable and adapter for an an individual brand (Apple, Blackberry, etc) but you'll need to buy an extra adapter if you own multiple brands. Note the PEG is primarily designed for smartphones, MP3 players, and PDAs. It can't recharge AA batteries, which power many GPS receivers and digital cameras, nor can it power larger devices like laptops. The Goal Zero Sherpa 50, left, is a high-efficiency battery that can power laptops. Nomad 7M solar panel, right, includes a connector similar to a cigarette lighter that can recharge small electronics. Goal Zero will soon release the Nomad 7M solar panel (right), which is billed as the most efficient on the market. The Nomad 7M is designed to deliver power directly to a device's battery (it has no power storage of its own) via either USB or 12-volt power inputs. Goal Zero's most practical power storage unit for the backcountry is its Sherpa 50, pictured at top left. The Sherpa 50 has a lithium-iron phosphate (LiFe) battery that can be daisy-chained to other Goal Zero storage devices for expansive storage options. (Another exhibitor told me LiFe is the "Cadillac" of battery technology). The Sherpa 50 weighs 2.2 pounds and retails for $249.99. According to the company, it can be charged with a wall outlet in two hours, or in eight hours with the Nomad 13.5 solar panel; it can power a laptop for two hours, an iPhone for 50 hours, and a handheld GPS receiver for 92 hours. I'll grant you this is a lot more juice than most backpackers will ever need, but if you're in the business of producing outdoor-related content like videos and photo essays, it could be worth a look. The Pocket Power Pack features a compact solar panel. Tech 40 is introducing this all-in-one solar package in mid-December. The Pocket Power Pack mates a solar panel with a lithium-ion battery that can be recharged by sunlight in eight hours or a wall outlet in 1.75 hours; retail will be $99.99. It comes with a zippered carrying case and also includes LED lights that can provide up to 30 hours of white light. The battery pack's electronics allow simultaneous charge and discharge, so you can use your device while its charging. Lots of universal charging tips: male USB, female USB, mini-USB, micro-USB, Apple 3G, and battery charging boxes for AA & AAA rechargeable batteries. So that's a quick look at portable-power highlights from OR. I heard that Petzl and Brunton added a few products, too, but I'm waiting on word from the companies to get all the details. I have used a Brunton Solaris 26 solar panel for about 6 years now. It powered my laptop when I bicycled across Alaska. It will charge my laptop, recharge my camera,cellphone and flashlight batteries as fast as if hooked up to AC/DC at home. I gave $240 for it in 2004 and now they cost about $650. It weighs less than a pound, unfolded is 3x4 feet, folded in its pouch its about 1x1 foot. I have power converter for it which adapts the solar to electricity to plug my battery charger into, it also has a cigarette lighter like adapter to charge a car battery, tho never having had a car I have never tried it. Panel prices seem to be coming back down, though I can't speak for the Brunton model you own. Actually, Gary, the cigar lighter adapter is not intended to charge a car battery. My Brunton came with a set of battery clamps which in principle could be used to charge a car battery. However, it would take a very long time. As mentioned in my Antarctica trip report, I used mine to recharge my camera batteries. It recharges my various Nikon batteries typically in 2 hours or less (EN-EL3e, En-EL5, EN-EL9). Tom, since you were going to the power places, I didn't include a couple I visited in my blogs (which I still have to finish). One was Energizer. They have a family of solar power storage units that are intended to power iPhones and other small devices. I also stopped by the Goal-0 booth. Were you there early enough to get one of the samples they were handing out? I think the limit was the first 50 or 100. I have a flashlight that is one of those "shake it" chargers like the nPower. I will have to try it on the pack, but it doesn't seem to store the power for very long. Hopefully the nPower people have more efficient power storage. Bill: I didn't get any free samples from Goal Zero (nor would it have been proper to accept them, truth be told). I'm not sure the nPower is a "shake it" charger -- it uses springs, a magnet and a microprocessor to establish and maintain resonance frequencies that adapt to the speed of the user's motion. At least to hear the inventor tell it, it sounded quite a bit more sophisticated than the "shake-it" chargers. I saw a few other solar/power brands out there but there aren't enough hours in the day to cover them all. Yes, Bill I have charged my camera batteries too in the field as well as kept my laptop up to charge. I find the Brunton panel to work very well. 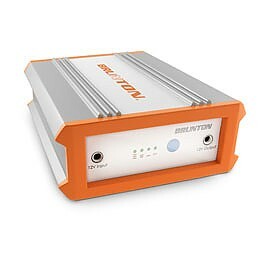 Have you tried any of Bruntons power storage units like the Solo 15? below is what they say about their product. I am curious about getting one for power options outdoors? No, I haven't used the Brunton storage units. They are basically the same thing as the Goal-0 storage units that Tom mentions, though, based on the product descriptions. From what little I saw, the differences are that there is more of a range of products (storage capacity and interconnectability) for the Goal-0 products than Brunton's. Their catalog talks about strapping them together. The problem I see with both is the weight of the storage units. The bottom line is that batteries are heavy, though as Tom noted, Li-Fe chemistry makes for lighter battery weight per watt-hour storage. Progress is being made pretty rapidly in the solar panel and battery storage fields. Solar panels are much more efficient now than when I first started studying them in the 1970s, or even a couple years ago when your and my Brunton panels were made. Just like with lead-acid car batteries. When I bought my first new car, car batteries had an expected life of 2 years for the premium ones. Now they are 6 years or more, and the "cold cranking power" (that is, temperature sensitivity) is vastly improved. You used to have to have a car battery heater for temperatures of about 10-20F. Now many of the batteries will crank the car after sitting out overnight in -20 to -30F (actually, I was easily able to start my car at -37F after sitting out all night a couple years ago). And a lot of the electronic gear needs much less power, so that helps as well. Well, I am looking for a solar power unit for use while in base camp or my planned retirement Tipi when I move back to southern Utah in a couple years. I plan to live in a tipi instead of a house for the remainder of my days. I lived in one in New Mexicos Gila Wilderness for 6 months 20 years ago while working as a land caretaker. I can get one for about 2 Grand. So how are you going to get your internet connection to the tipi? You are required, after all, to continue contributing to Trailspace. I will be able to connect down at the Thunderbird Best Western in Mount Carmel Utah which will be a few miles away from where I hope to live in my Tipi. This is the country area where I will be living around Mount Carmel. Hwy 89 is cutting across that hill in the center of the picture. 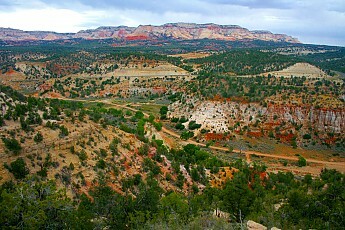 Mount Carmel is a mile north, Kanab Utah is about 16 miles south. Thats the White Cliffs of the Grand Staircase in the distance and what I am standing on when I took this shot. The East Fork of the Virgin River is below me running west to the Parunuweap to the right. Really lokning forward to the nPower Peg. But it have been 'shipping in a few weeks' for two yeats now. Check out http://e-solarproducts.com/Solar-Camping-Gear.html I bought their "portable power system" and love it. I agree with Bill S, I hope the nPower Peg works better than a shake flashlight. At least it is not something you have to always intentionally shake to charge, but take advantage of your kinetic movement you are already creating. I like the idea of it charging without the need of light as my solar power stuff only works during the day, but solar charges even while resting, or just leaving it by my tent during the day. Obvious trade offs. It is bigger and heavier than I would hope, and I am not sure I want to take the risk on testing how well it works at $149.